James Gostelow recalls the moment when Amy Winehouse elbowed him in the forehead thinking he threw a hat at her beehive. 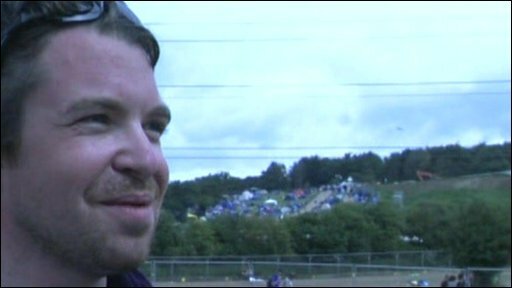 A man who was allegedly elbowed in the head by Amy Winehouse at Glastonbury Festival has handed mobile phone footage of the incident to the BBC. James Gostelow, 25, from London, said the singer caught him on the forehead after someone in the crowd behind him threw a hat at her. Winehouse, 24, was seen apparently lashing out at the audience during her Pyramid Stage performance on Saturday. But police said they had received no complaints of assault. 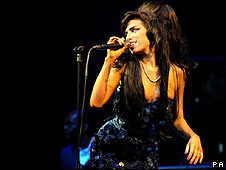 Broadcast footage on the night appeared to show Winehouse elbow one fan after being hit on the head by a hat, then throw a series of punches into the crowd. Mr Gostelow said the incident was a case of mistaken identity. "I saw a hat being thrown from behind me and it hit Amy's beehive. She looked down, saw me looking up, and her elbow went for me. "She caught my forehead, then someone may have shouted something from the back, which is when she went in again." Winehouse, who performed in front of an estimated 75,000 people, jumped off the stage and into the security pit for the last two songs of her set. Speaking after the incident, Glastonbury organiser Michael Eavis defended the star, saying she had appeared to lash out after being touched by a fan. Mr Gostelow, who did not see anyone touch the singer, said he was "shocked" rather than sore. He added that while he was "disappointed", he had no intention of making a complaint to police. "At the end of the day it is all part of being at the front and being pushed by thousands of people. It is all part of the Glastonbury experience," he said. "I'm just pleased I got to see her. She did a great act. "Not everyone can say they have been hit by Amy Winehouse. I just want to shake the person who threw the hat." A spokesperson for Winehouse was not immediately available to respond to Mr Gostelow's comments. On Saturday, her representatives said: "The 'lashing out' was when someone tried to grab her hair and she reacted."